A rare day off and a rare clear day and we finally got a bit of work done on the revisions to Tesla's Revenge. The new hardtop, the roof that will enclose the cockpit into a wheelhouse and support the solar panels, will be a pergola-styled structure, stained to match the teak on the rest of the boat. 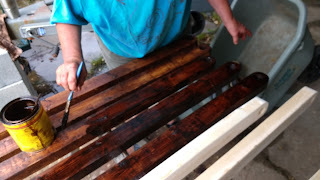 So on a cloudy day and in our right minds and everything we ventured out and purchased wood for the top. Shaping the beam ends for the pergola roof. One of the purchases we've made recently was a suite of cordless power tools, including a jigsaw and mouse sander. 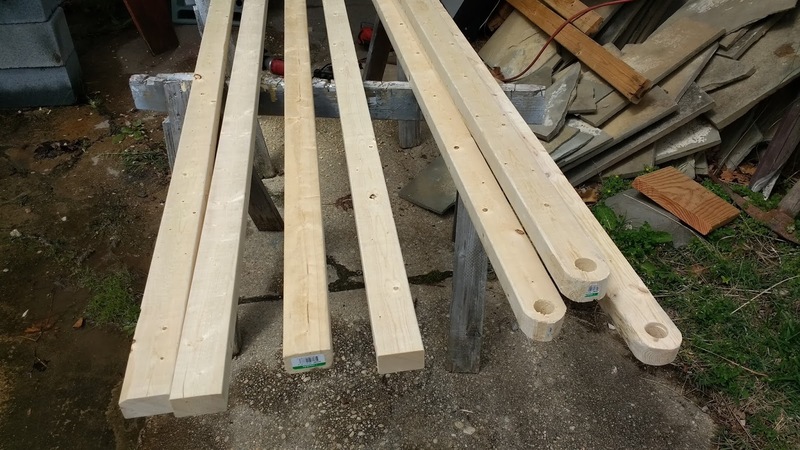 The sander, particularly, proved useful in dealing with this project, but in dealing with the 1 1/8" holes in the beam ends, I was forced to resort to the massive drill I purchased to drill the holes in the support beams of Floating Empire nearly four years ago. The little 20V drill just wasn't up to the task. 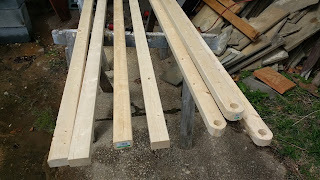 So after the insanity of Memorial Day weekend, we'll be getting more lumber and fabricating the rest of the top and, hopefully, removing the mast before all this happens. Hey, more stuff over at Life, Art, Water. hello from pasadena, upper magothy river. former sail boater& part time live aboard. sold the boat several years ago but still like reading about the L-A lifestyle. discovered your blog thru the boat mag.